Brig Abhay A Bhat (Retd)is an alumnus of National Defence Academy (NDA) was commissioned into the Corps of Signals in December 1982. He has done his B.Tech. in Electronics and Telecommunications from Military College of Telecommunications Engineering, Mhow (MCTE). Brig Abhay A Bhat has graduated from the prestigious Defence Services Staff College, Wellington, where Army officers are trained in the nuances of staff function of various operations. Due to his professional caliber, he was sponsored by the Army to attain M Tech in Computer Science and Engineering from IIT, Kanpur. The officer has also acquired a Master's degree in Personnel Management from Pune University. He has served in counter insurgency areas of Assam and J&K. Brig Abhay A Bhat commanded an Armoured Division Signal Regiment during op PARAKRAM, and has served on the staff of MS Branch, (which is responsible for career management of officers) of the Integrated HQ of MoD. He was also involved in implementing IT projects for developing Information Technology Infrastructure in remote areas of North East. Brig Abhay A Bhat has been awarded the Chief of Army Staff Commendation Card in 2011, for outstanding work in the field of Signal Intelligence in support of the operations in J & K.
The officer was the Commander of the Faculty of Communications Engineering at MCTE from 2011 to 2014, where he presided over the Engineering Degree training for Army officers, He pioneered many automation projects and modernisation of laboratories, as well as pioneered the e-learning environment in MCTE. He was the Chairman of the IETE (Institute of Electronics and Telecom Engineers) Sub centre, Mhow from 2011 to 2014. Brig Abhay A Bhat has written articles in defence publications on e-learning and Knowledge management. He has participated in many Seminars and Conferences as panel member in the fields of Next Generation Networks, Cyber Security and Defence Communication Technologies. He has also been aKey Note speaker at a Seminar on "Antenna and RF Technologies" at IIIT Allahabad. Before his retirement, Brig Abhay A Bhat was posted as the Chief Signal Officer of the Maharashtra, Gujarat and Goa Area; responsible for the Army telecommunication and IT networks in these states. 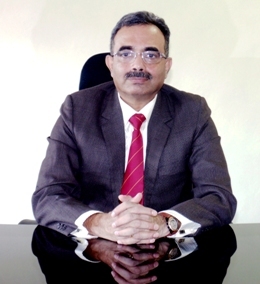 Brig Abhay A Bhat has recently taken over as the Director, AIT. AIT will be completing its 25 years of existence in 2019. In effect we are entering the Silver jubilee year and are doing this in style with smashing all round performances in current academic year. Having received the "Best Professional College (Urban)" trophy in Pune University in Feb 2017, our students have displayed resounding academic performances. More than 95 % of the 2017-18 batch have passed out with first class and above results. There are over five University rankers during this academic year. Various ranking agencies have consistently placed AIT amongst the top 100 colleges the country. The most reputed and widely accepted ranking agency, the â€œNational Institute of Ranking Framework(NIRF)â€ has placed AIT at 88 in 2018 survey, and 17th amongst private colleges, well above almost all of the other Private Engineering colleges in the region. India Today and Outlook surveys place AIT within 60 positions all India. These amazing rankings, despite minimal PG and PhD student footprint, is essentially due to strong student performances, excellent infrastructure for all round development and ever improving placement scenario. The placements have again been our high point with 93 % students from this batch placed through campus drives. The average salary for this batch has risen to Rs 5.9 Lakh. For the first time in the history of AIT, Microsoft selected five students, with a CTC offer nearing Rs 39 Lakh. Other high profile recruiters (in Rs 8-20 Lakh, per year bracket)included Amazon, Adobe, Directi, ION Trading, Veritas, Oracle GBU, Oracle Fin Services, Barclays, Saint Gobain, Josh Software, HSBC John Deere, Deloitte, Robert Bosch and many others. Our student technical teams did exceedingly well, winning prizes at many national level hackathons, technical competitions and Robocons. Notable amongst these were the first prizes in Barclays Hackathon, Vistara International Hackathon (first prize Rs 100,000/-) and Facebook Digital Masala Challenge (first prize $ 5000). Students have as usual been blazing the sports field, winning many inter collegiate competitions and representing SPPU in many sports especially in Cricket, Squash, Tennis and Basketball. Our faculty too have done their bit to enhance their reputations. Six teachers have completed their PhDs in last academic year. Prof Dr SM Sansgiri has been awarded the prestigious Shree Dewang Mehta national award for best professor in Mechanical Engineering. Our training and placement officer(TPO) Prof Manoj Khaladkar has won the best TPO in Western region from Computer Society of India as well as the GOC-in-C Southern Command Commendation card. AIT boasts of excellent infrastructure, which has been developed over the years. We now have a full wifi campus served by a 1 GB backbone connection on the National knowledge network. Many Advanced computer and IT labs, a mechanical workshop equipped with all types of fabrication machinery, CNC and CAE machines, design lab, robotics labs, 3D experience product lifecycle development labs are a few such facilities. A modern, well stocked library, with spacious reading rooms enhances the cerebral offerings. AIT also has great sports facilities including squash, tennis and badminton courts. Being a residential institute, AIT is able to ensure all round development of the students and transform them into complete engineers and great citizens of the country. The Silver jubilee year is being celebrated in many ways. We are planning to have some memorable events such as hackathons, Industry-AIT conclave, special Alumni get together and many more. Our enthusiastic students are also preparing to embark on a cycle expedition. The celebrations are planned to culminate into Silver Jubilee Convocation and AIT day celebrations on 24 Feb 19. With the talent, dedication and commitment of faculty, staff and outstanding students of AIT, it is inevitable that AIT will scale new heights in this Silver Jubilee year. 'Onward to Glory' , 'Jai Hind'.